Lip fillers or lip augmentation treatments have become common practice in the UK. The process is simple and straightforward with minimal discomfort and a short recovery period. For those dissatisfied with naturally thin or uneven lips, or if the natural ageing process is having a negative impact on your lips – losing shape and form – then lip fillers are an ideal non-surgical treatment. You’ll undergo an initial consultation with our qualified skincare specialist here at the Wentworth Clinic who will explain the procedure, ascertain whether the lip fillers are right for you, and explain any pre or post-treatment care that may be required. Any fears or concerns will be discussed, and once you are happy to proceed, we will schedule your lip enhancement appointment. 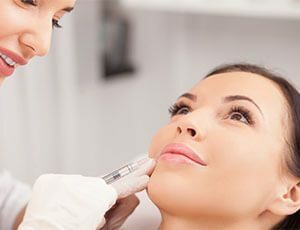 We use only the best lip filler products on the market which include Juvederm, Restylane and Teosyal – these dermal fillers contain hyaluronic acid, a naturally occurring acid in the human body which retains water – this is what creates the plumping effect and smooths fine lines and wrinkles around the lips. If you feel that Lip fillers are something you’d like to investigate further then please continue reading below, or contact one of our clinics and one of the Wentworth Clinic team will be happy to discuss further and arrange for an initial consultation with our dermal fillers specialist. Inflammatory reactions – (redness, oedema, erythema, etc) which may be associated with itching and/or pain on pressure, occurring after the injection – these reactions may last for up to a week. Induration or Nodules at the injection site. Staining or discoloration of the injection site. Cases of necrosis in the glabellar region, abscesses, granuloma and immediate or delayed hypersensitivity after hyaluronic acid and/or lidocaine injections have been reported. It is therefore advisable to take these potential risks into account. Patients must report inflammatory reactions which persist for more than a week, or any other side effect which develops, to their medical practitioner as soon as possible. The medical practitioner should offer an appropriate treatment.